MorganStanleyGate: Bank Foreclosure Fraud - Exhibit V - Is This Banker's Betrayal Worthy of Capital Punishment? Bank Foreclosure Fraud - Exhibit V - Is This Banker's Betrayal Worthy of Capital Punishment? NEVER in default, and with regard to Spencer C. Young's residence in Chapel Hill, NC. . This instance of bank foreclosure fraud was carried out by Paragon Commercial Bank (with assistance provided by their attorneys, Poyner & Spruill) at the behest of Morgan Stanley (and their attorneys, Kirkland & Ellis) as a dastardly form of cover-up, so as to deprive Mr. Young of resources and undermine his professional and personal credibility, so he could not viably pursue his now massive claims in the MorganStanleyGate scandal. 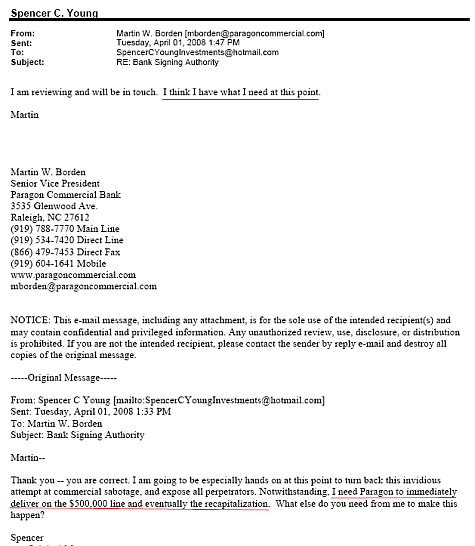 Paragon Commercial Bank 's foreclosure fraud began with an especially diabolical betrayal by Spencer C. Young's relationship banker, Martin Borden. Mr. Borden is a Senior Vice President and Head of Commercial Real Estate Lending at Paragon. Mr. Borden's experience in real estate lending was then, and continues to be dwarfed by Mr. Young's prodigious banking career experience, which includes $32 billion in commercial mortgage related transactions -- in fact, if you aggregated the transactions completed by every banker at Paragon throughout their careers, the sum total dollar amount of transactions would NOT come close to that done by Mr. Young, considered one of the pioneers of the Commercial Mortgage Backed Securities ("CMBS") market. And because of Mr. Young's deep background in finance, banking and real estate, Mr. Borden typically provided Paragon's then current lending parameters and financing terms, and Mr. Young would underwrite, price and size the loan that Paragon would then make. All the financings Paragon completed for Mr. Young (four financings totaling $5.1 million on properties valued at $20 million), were effectively predicated on a hand-shake and this mutually acceptable and successfully practiced arrangement. Moreover, as his personal banker since 2004, Mr. Borden gained Mr. Young's trust as a confidant, and was part of his real estate investment advisory team -- little did he know Martin Borden would abuse that trust in a profound and pernicious manner, as described herein. 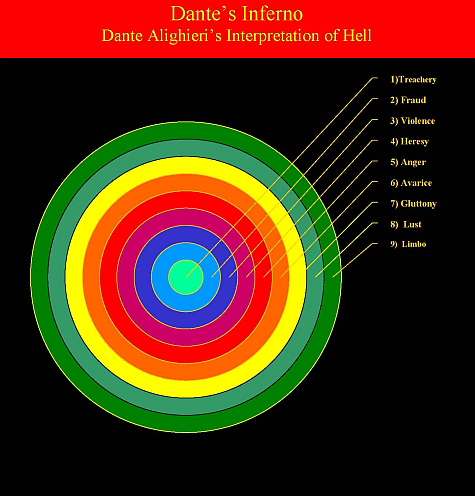 To provide context to how devastating Martin Borden's betrayal was, consider the following: In the classic, Inferno, 14th Century Italian Philosopher, Dante Alighieri believed Treachery (violating one's trust) and Fraud (in this case 20 separate elements of fraud) are considered to be sins more reprehensible than Violence such as Murder (see Figure 1) . . . this being the case because such transgressions can be unimaginably painful to a large number of people (as was eventually the case), typically go unpunished and are often replicated throughout the lifetimes of the perpetrators. Finalizing an amicable divorce settlement with Maria Young, his wife of 24 years, so he could continue to provide well for her, as he always had. [Note: He and Maria had been separated since 2005, a sad manifestation of the chronic stress of MorganStanleyGate. Everything Hinged On The Planned Recapitalization . . . He also discussed at length the recapitalization of his North Carolina investment properties, which would yield substantial value accretion, and provide the liquidity to pursue the investigation and prosecution of the aforementioned anomalies, which ALL suddenly began in a seemingly orchestrated fashion during the Summer of 2007 -- this was NOT a coincidence, but rather an instrumental part of the MorganStanleyGate cover-up. Earn-Out Provision -- As new leases are executed additional loan proceeds of up to $2.0 million and subject to conservative debt service coverage (1.5X @9.0% constant) and loan-to-value (<50%) parameters, would be made available to complete the redevelopment work in progress at The Pit Stop of Durham and The Courtyard of Chapel Hill. 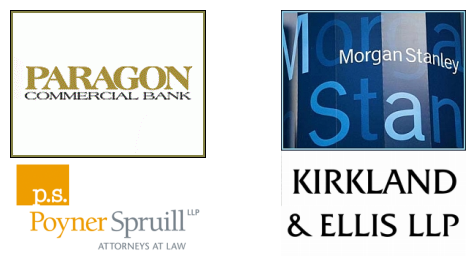 Click here for more on this recapitalization.
. . . Which Was Structured To Be A "No-Brainer"
Anyone conversant in commercial real estate lending would agree that the Recapitalization terms outlined above were not only sound from a credit standpoint, it was a readily doable transaction, or a "No-Brainer" in commercial real estate lending parlance -- an assessment with which Martin Borden agreed because the contemplated financing was WELL WITHIN Paragon's lending parameters. It is also relevant to point out Paragon was NOT impacted by the sub-prime mortgage banking crisis that later emerged because Paragon did NOT make residential mortgage loans. As structured and agreed to by Martin Borden, the Recapitalization would establish a strong fiscal foundation for the foreseeable future, thereby comfortably ensuring Mr. Young's ability to financially provide for all his loved ones, as he had long been doing, for some for more than two decades. His loved ones included: Maria; his mother (Edna May Young); his sons (Michael, Kevin & Ryan Young), who were all attending college; and his fiancee' (Leah Krier), who was pregnant, and due to give birth in April 2008. Since the outset of their banking relationship, Mr. Young had waxed eloquent to Mr. Borden about the importance of establishing a strong fiscal foundation for his commercial real estate investments in North Carolina to enable him to pursue his mounting civil claims in the MorganStanleyGate scandal. When Mr. Young was going through his divorce, he involved Mr. Borden in the negotiations of his Divorce Settlement Agreement ("DSA"), and providing him a final executed copy of it when completed (see Figure 2 below). Every banker knows that contentious divorce can be disruptive to a borrower's financial stability, and an amicable settlement often ameliorates any deterioration in the creditworthiness of the borrower. Unsurprisingly, Mr. Borden vowed his complete cooperation. Mr. Young kept Mr. Borden apprised of the key financial provisions of the DSA throughout the negotiations to ensure what was ultimately agreed upon were acceptable to Paragon -- this being the case because certain provisions were entirely predicated on Paragon financing. In other words, Mr. Young would not agree to any provision unless Mr. Borden provided assurances that Paragon would deliver. 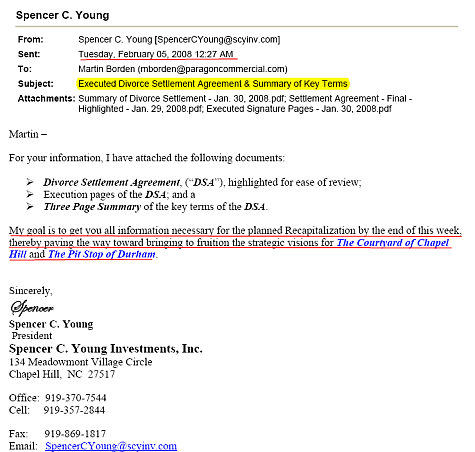 Importantly, throughout their banking relationship, Mr. Borden had always made good on his commitments, so there was no reason to doubt his integrity here -- in fact just days earlier, he had made good on financing Mr. Young's critically important acquisition of land parcels to be used for stacked valet parking at The Courtyard of Chapel Hill (discussed below in the next section). 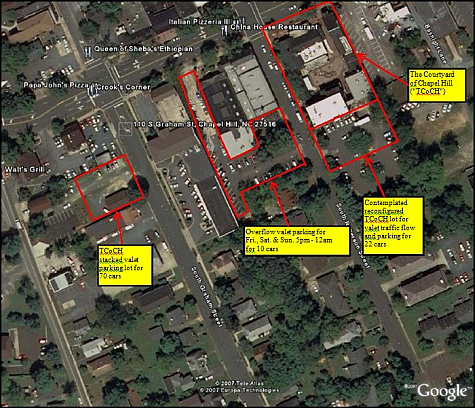 Concurrent with successfully arriving at an amicable divorce settlement, Mr. Young also acquired two adjacent real estate parcels on Graham St. in Chapel Hill (see Figure 3 below). Substantially boosted the value of this property, such that the aggregate loan-to-value of this property would be 42%. And this is why Paragon financed 100% of the purchase price (see Figure 4 below) of this strategically important acquisition on January 25, 2008 . . . five days prior to finalizing the DSA. Figure 4. Closing Statement for Acquisition of Valet Parking Lots on Graham St. 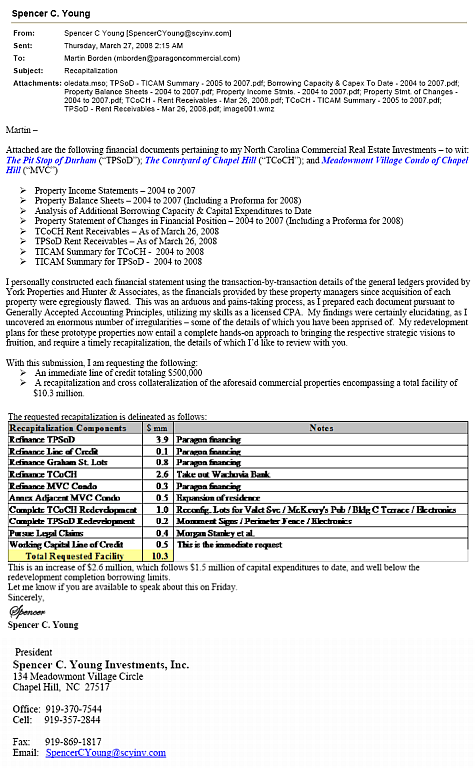 Shortly after completing the acquisition of the Graham St. parcels, a SIGNIFICANT change in Mr. Borden's behavior was evident and well documented in the below documents (Figures 5 through 9), leading to Paragon dragging out a decision for nearly 4 months, when it had made prior credit decision within a few days, eventually reneging on phases #2 (Line of Credit) and #3 (Earn-Out Loan) of the agreed-upon recapitalization. 100% Financing -- There is NO LEGITIMATE BANK IN AMERICA who would finance 100% of the acquisition price of the Graham St. parcels and then withhold the monies (i.e., the Line of Credit) necessary to configure those parcels for stacked valet parking use. They even knew their line of credit would be used to pay the real estate taxes on the additional collateral (The Courtyard of Chapel Hill) and would otherwise be delinquent. Strong Business Acumen -- Mr. Young is a an accomplished business and banking executive, who would have NEVER signed the Divorce Settlement Agreement without Martin Borden's (i.e., Paragon's) absolute assurances of making good on the Recapitalization, and in reneging, Paragon DIABOLICALLY caused Mr. Young to immediately default on the DSA, which then converted an amicable divorce into a contentious one. Again NO LEGITIMATE BANK IN AMERICA would do this. Can't Be Half-Pregnant -- In completing Phase #1 (Acquisition of the valet lots), but dragging out Phase #2 (Line of Credit) Paragon effectively prevented Mr. Young from lining up alternative financing, (especially under the circumstances). NO LEGITIMATE BANK IN AMERICA would do this. Collusion in Staged Default -- By delaying as they had, Paragon DELIBERATELY caused monetary defaults on his loan to Wachovia on The Courtyard of Chapel Hill, which had NEVER been paid late prior thereto. Also contributing to this default were inexplicable delays in the sale of Mr. Young's NY residence by the attorneys representing mortgagees MORGAN STANLEY and WACHOVIA. NO LEGITIMATE BANK IN AMERICA would do this. Premature Acceleration -- Wachovia then prematurely accelerated the loan and rebuffed offers to cure once the sale of Mr. Young's New York residence was completed -- in other words, Wachovia prevented Mr. Young from curing the fraudulent default THEY orchestrated. NO LEGITIMATE BANK IN AMERICA would do this. Get the picture? If not, click here to see how Morgan Stanley, Wachovia and Paragon are LINKED in this dastardly Machiavellian scheme. Caused the Default on the Divorce Settlement Agreement -- this made Mr. Young appear to have bilked and defrauded his ex-wife. This turned his amicable divorce into a contentious one, and is one of the primary reasons why his sons Michael, Kevin & Ryan have estranged themselves from him. Rendered Mr. Young's Ex-Wife Homeless After Cancer Diagnosis -- By reneging on the recapitalization, Mr. Young could not provide monies for a smaller home for Maria Young, and Martin Borden was FULLY AWARE Maria Young was diagnosed with pancreatic cancer in February 2008. This additional stress no doubt contributed to her death last year. Prevented Completion of the Redevelopment Work -- ALL planned redevelopment at The Courtyard of Chapel Hill ("TCoCH") and The Pit Stop of Durham ceased, and the accretion in value was abruptly stopped. Caused the TCoCH Loan Default -- In failing to provide the agreed-upon credit line, the Wachovia loan went into default, and this property was eventually lost in via UNCONTESTED foreclosure fraud, as Mr. Young was UNLAWFULLY denied legal representation. Set the Stage For Paragon's Eventual Foreclosure Fraud -- A year later Paragon, initiated 20 separate elements of foreclosure fraud to steal Mr. Young's remaining real estate properties and render him homeless. Should Martin Borden Be Put To Death ? NO !! Martin Borden of Paragon Commercial Bank has empirically proven WHY, according to Dante Alighieri, he should be subjected to capital punishment -- however, this is not 14th Century Italy, and we are NOT barbarians. Notwithstanding, the manner in which he and his partners in crime at Paragon Commercial Bank (notably Bob Hatley, Matt Davis and Jim Hoose) and Poyner & Spruill (in particular, David Warren and Dan Cahill) are going to be publicly prosecuted to the fullest extent of the law, they will wish they had.